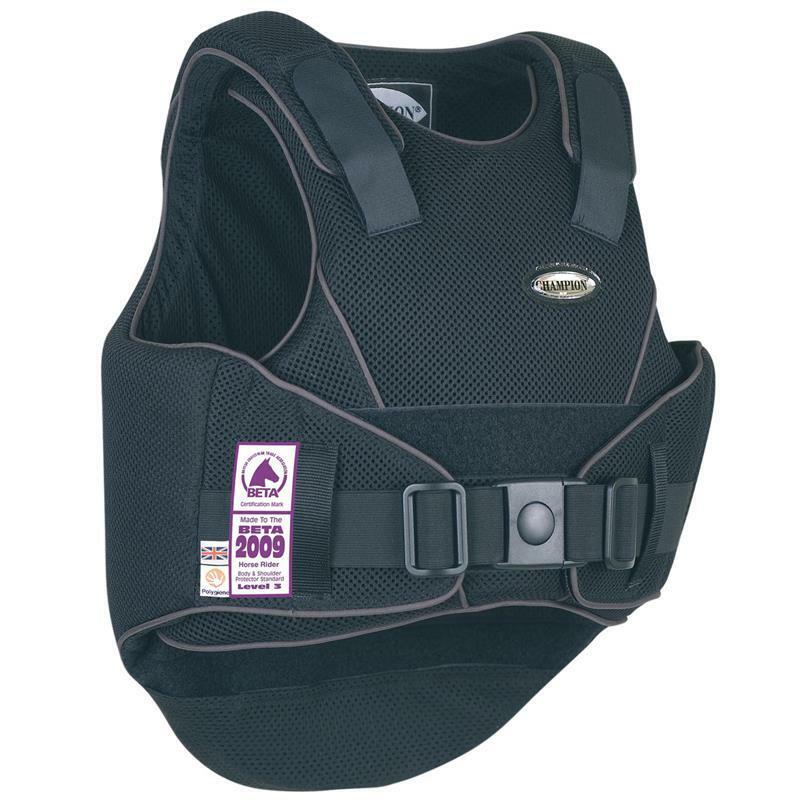 Champion Flexair Children's Body Protector - Black. Champion's reputation is built on safety and again with the FlexAir they are leading the way - meeting the new 2009 EN 13158 Standard. Champion is at the forefront of research and innovation. On this model Champion have incorporated a buckle safety clip, to further enhance rider’s piece of mind. Through the combination of our ultra lightweight multi layered nitrile foam, and the unique positioning of ventilation holes, Champion has created a supremely supple yet secure feel with the FlexAir. This high level of flexibility is perfect for any riding position, and ensures a most comfortable fit to the protector. Champion have made the FlexAir cool to wear, this has became of paramount importance in the early design stage. Champion enlisted the help of some of the Worlds elite riders to help address this issue. Through the exclusive combination of our foam ventilation holes, and outer lining spacer fabric cover, we have created one of the most breathable body protectors ever seen on the market. Again Champion has understood the need for comfort when riding; they have sourced materials accordingly with this in mind - The Nitride foam is one of the lightest available today giving the FlexAir a feather light feel. Stables, Horses and long rides can combine to create a perfect breeding ground for bacteria - That is why Champion has treated the FlexAir's inner mesh lining with Polygiene, through the use of environmentally friendly silver ions Polygiene kills bacteria on contact, Poloygiene is currently being used in British hospitals to help prevent the spread of MRSA. This means for you the rider is an odour free, longer lasting, fresh feeling lining; minus all those nasty bacteria's. In conclusion; the all new FlexAir has Safety, Flexibility, Breathability, a feather light feel, an Antibacterial lining and to top it all off amazing looks! Please note that for Health and Safety reasons we are unable to accept returns and/or exchanges on any body protectors or riding hats. We recommend that you have a fitting prior to purchasing online. This does not affect your statutory rights.